LBJ was a U.S. Senator from Texas for a dozen years before he became President John F. Kennedy’s vice president. During his vice presidential term, he was instrumental in launching America’s manned space program. He became president when JFK was assassinated on November 22, 1963, and sought to continue and vastly expand Kennedy’s social initiatives in a program LBJ called the Great Society. 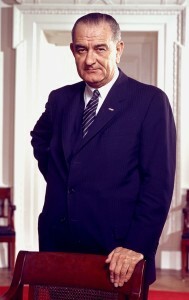 LBJ signed into law the epoch-making Civil Rights Act (1964) and the Voting Rights Act (1965) and introduced Medicaid, Medicare, and other social welfare initiatives. His dramatic expansion of the Vietnam War drained much of the funding from the Great Society and deeply divided the nation. Having been elected to a term in his own right in 1964, he was eligible to run again in 1968, but, recognizing himself as having become a divisive force, he chose not to. In 1969, when he left office, the Vietnam War remained unresolved.